STEAM -Engineering and Technology are innately HUMAN. Our ability to think logically to create tools and solutions to improve the quality of life is paramount to our existence. The STEAM initiative at SJNRCS will: Provide students access to technological problem solving that fosters critical thinking skills Provide teachers and students a resource network to incorporate STEAM activities into the curriculum.The Engineers Club will meet once a month. Activities are based on the four traditional classification technology and engineering: Construction and statistics, transportation and dynamics, manufacturing, and communications. Students in grades 1st through 8th can also participate in our Robotics and Coding Clubs. This STEM-based club teaches students about engineering and design. Students will build robots and some will enter them into VEX Robotics competitions.Please note that this activity requires an additional fee. Chess Club – The Chess Club is open to students in grades 2 – 8. Students are introduced to the basic rules of the game and continue to play and learn new strategies throughout the school year. Chess Club meets once a month after school for 45 minutes. This is the place for all kinds of logic, creative and kid-friendly game playing. Drama Club – Two grade levels 2nd – 6th and 6th– 8th who are interested in a career on Broadway have the opportunity to join the Drama Club. They will experience all facets of theater such as acting, staging, and crew, and directing. Three to four plays are produced each year and presented to the school community, parents, and friends. Drama Club members must be committed to frequent after-school rehearsals. Boy Scouts – At the beginning of each school year, the Boy Scouts hold a round-up for boys to join: Cub Scouts for grades 1 – 5 and Boy Scouts for grades 6 – 8. Students can achieve the core objectives of strengthening character, personal fitness, and good citizenship. 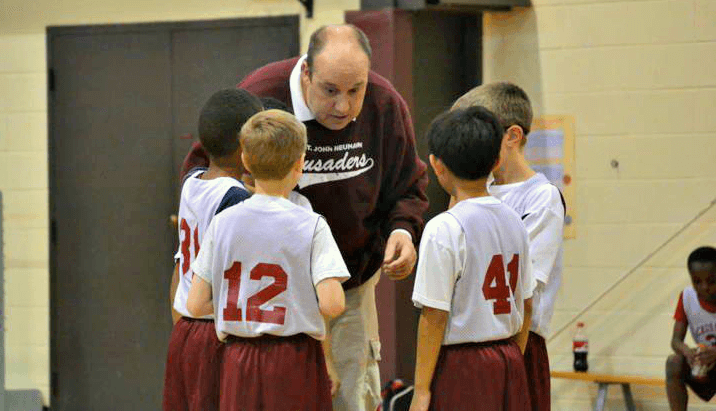 Basketball – A basketball program is offered for boys and girls in grades 3 – 8 through St. John Neumann Parish. Registration is at the beginning of the school year and practice begins in October. Games are played on weekends from November through February. Teams usually practice one night a week. St. John Neumann teams play in the Catholic Metro League of Atlanta, which consists of teams from Catholic schools and parishes in the metropolitan Atlanta area. The league rules provide for mandatory play by all student-athletes, regardless of skill level, ensuring participation by all team members. Click here for a registration form. Please note that this activity requires a registration fee. Volleyball – Girls in grades 5 – 8 are eligible to play on one of the SJN parish Volleyball Teams. Practice begins in June and games are played from August through October. The teams travel to other Archdiocesan schools to compete against other teams in their category. Volleyball is an indoor sport with 6 per side play. Girls in grades 5 and 6 learn the basics of volleyball on a semi-competitive team. Girls in grades 7 and 8 play on a more serious and competitive level. This sport inspires both team and individual learning skills and allows everyone equal play time. The SJN teams are registered with the Catholic Metro Volleyball Association. Please note that this activity requires a registration fee. Girls’ Fitness Club – Beginning in January, girls in grades 3-5 can participate in a fitness club. Whether you are interested in earning the National Fitness Award, running your fastest mile, or just RUNNING when you complete the mile, this is going to be a fun club! With social interaction and community leadership skills as a goal, we will emphasize all types of fitness activities. Girls will train to run a 5k road race and set a community project goal (raising funds or awareness for a specific cause to be determined by the group). Softball Skills – 1st through 8th-grade girls and boys can participate in softball skills training from November through February! Basic equipment is needed (gloves and bats, batting helmet if you have it). We will work outside on the playground, indoors in the gym, and on our church softball field across the lower parking lot. We’ll be learning the rules of the game while building teamwork and friendships throughout the grade levels. Softball – SJN Softball is a great ministry, the largest youth group at church. Not CLMA, our Elementary coed league and MS/HS coed league play each other at the church baseball field. We play two seasons a year, August to October and March to May. Need not be a church member to play. Children on the team are from all schools, SJN, SPX, Marist, South Gwinnett, Parkview, Brookwood homeschoolers. All are welcome, experienced or not. There is a $50 sign-up fee. Students for Life – SJNRCS hosts a middle school chapter of the national Students for Life organization for our seventh and eighth-grade students. The mission of Students for Life! is to help build a “Culture of Life” where young people are empowered and equipped to lead their peers in this human rights movement to save vulnerable lives. Activities include: organizing a “Baby Shower” to benefit Birthright; visiting residents of local assisted living facilities; attending the archdiocesan Mass and Right to Life rally on January 22nd; discussing timely pro-life issues in an age-appropriate venue. Student Council – The Student Council represents the student body and helps establish a good relationship between faculty and students, and between students themselves. This organization supports and encourages ways to promote school spirit and initiate school activities. They meet twice a month. The Student Council consists of co-presidents elected by middle school students in the fall from the eighth-grade class and two representatives from each homeroom in grades four through eight elected by their classmates. The desired qualifications of Student Council members are integrity, honesty, respect, concern for others, a sense of justice, and satisfactory conduct during the previous school year. Students must maintain average grades and satisfactory conduct. Safety Patrol – All students in middle school may serve as morning Safety Patrols. They help students exit their cars and assist younger students with arrival procedures. Safety patrols are expected to be on duty from 7:30 am to 8 am. Students serve on a monthly rotating basis. WSJN News Crew – The closed circuit Video Lab at St. John Neumann Regional Catholic School is used to produce a daily morning news broadcast which includes prayer and important announcements. The crew consists of middle school students who volunteer their time and talents on a rotating basis. They come to school early every morning to prepare for the broadcast. The students learn to use the equipment, collect the news items, and take turns anchoring the news on camera. The Video Lab is student-driven and taught and supervised by the Media Specialist. Yearbook – The objective of this organization is to produce a quality yearbook using the Webease software program. Students in eighth grade learn computer techniques and caption writing skills required to put together a memory book for the school. The Yearbook staff must possess integrity, organization skills, basic computer skills, artistic style, and dependability. Students on the staff meet once a week from 7-7:45 a.m. and must also expect to perform routine tasks after school. Some will gain experience taking photos with the school’s camera. The most important ingredient for a successful staff is cooperation. Garden Club -Designed for students in grades three through five who enjoy planting, harvesting and eating what they grow. 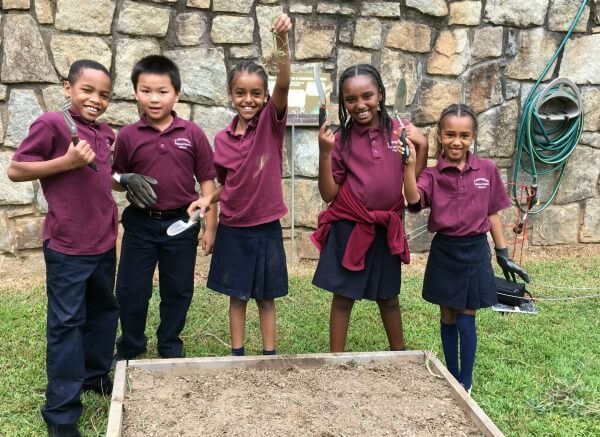 Students will learn to prepare the soil for planting, the types of plants that grow in our region and what season the different plants grow best. They will also learn how to care and encourage growth and how to best harvest the fruits, vegetables, and herbs for cooking. And best of all, students will get to cook and prepare a meal for their group and others. Book Club – Join other students in grades 5-8 who love reading all different genres of middle-grade books. This club emphasizes being open to new authors, old classics, forgotten stories, and new favorites. Independent reading throughout the month will end in a monthly meeting/book party. Those who complete the monthly book share book-related snacks and drinks. If there’s a movie based on the book, we watch part or all of it, time permitting. This is a Google Classroom discussion format during reading. This club runs through the entire school year. Homework Club – Providing academic support for students who feel they or their parents believe they may need additional support from a teacher to successfully complete their assignments. Liturgical Music Team – Middle school students are offered a unique opportunity to participate in our school Masses by joining the Liturgy Leadership Team. The team consists of vocalists and instrumentalists who lead the worship music at school Masses and other liturgical events for the school. Students rehearse weekly after school. The team encourages any middle school students who would like to participate in worship to join them. Click here for a permission slip. Altar Servers Society – Students in grades 5 – 8 are eligible to join the Altar Servers Society and assist at daily mass in the St. John Neumann Parish. Training sessions for students take place during the course of the school year. These learning sessions teach students to serve in the church with respect, love, and dedication.